If the great triumph of superheroes on the big screen owes its comprehensive success to any one specific person or thing, that distinction belongs solely to the moment in which Christopher Reeve tears open his shirt and exposes a giant red “S” in the middle of his chest. That split second of footage, a mere morsel it seems amongst a slew of great scenes and sequences in the original “Superman” film, characterizes the essence of the conflicted superhuman crime-fighter almost instinctively: the costume is not just some random impulse intended for casual dress-up, it comes attached with all kinds of responsibility. An entire city, and therefore an entire population, trusts him to keep peace, fight crime, uphold justice and look out for every individual’s best interest. He is a god amongst diverse believers, a public that stands in the shadow of a world so littered in turmoil that wildly fantastical heroes are the only hope they have. And yet no matter how many beasts or brutes he may tame, no matter how many sinister plots he may thwart, no one consciously seems to realize that the person wearing the costume is, too, a living and feeling human being at the core. To successfully adopt the identity that he does, his personal identity must remain secret to all around him, which thus restricts his ability to maintain a decent personal life. It is a hard job for a guy who seems to sociable and friendly to his peers, but it is unwavering nonetheless. All of these ideas, these images, are fresh in the mind when the lights go down and the opening credits for “Superman Returns” begin to rush off the screen. Only one question remains, though: is there any room for the man from Krypton at this point? The character of Lois Lane (Kate Bosworth) asks this question early on in the picture, angered at the prospect that the man she had fallen in love with suddenly disappeared without a trace, leaving her alone in the world and forcing her to move on with her life without him (she has even won a Pulitzer Prize for penning an article on why the world no longer needs the superhero). This is, of course, a question that audiences have to ask themselves as well. Much has happened, after all, since Superman was last an object of heroism in the movies – superheroes have grown more skilled, more clever and less conventional in recent years, while Reeve, the actor who so skillfully embodied the persona through four movies, is now no longer with us and has always been pertained as irreplaceable. To a certain point, in fact, the whole purpose of the film comes down to whether there really is anybody other than he who is capable of taking charge of the larger-than-life role. The answer, thankfully, is yes. 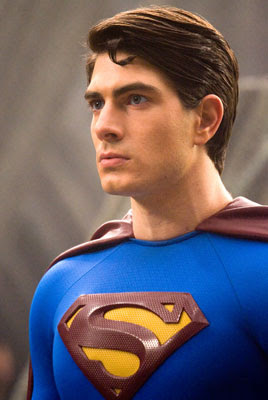 Brandon Routh, a relatively unknown face in Hollywood thus far, is as convincing and effective in the role of Superman as possible, playing the material with the same kind of unhindered innocence and boyish charm that helped Reeve in the earlier films. There’s also a certain slyness to the way he embodies the Clark Kent side of the character; the goofy exterior and clumsiness of earlier incarnations remains in spirit, but Routh augments those qualities with a hint of confidence that makes his nerdy alter-ego almost as effective as his other. The movie doesn’t surround him in ego or conceit, either; when a hero as beloved as him returns from a long absence, one would expect the material to cave into the mechanics of allowing its main player to over-analyze his own importance, yet the movie thankfully doesn’t do that. Superman is still a growing person, and a person who still has a lot to learn about himself, the people around him, and the essence of being a savior of the people. But here is where the movie makes a serious error: it sidelines the prospect of solid character exploration in favor of a plot so silly and clumsy that even children would find reason to roll their eyes at it. In it, known arch-enemy Lex Luthor (played here, oddly enough, by Kevin Spacey), now out of jail and in control of a widow’s massive fortune, aspires to transfer the supreme powers of Gods to ordinary people… or, more specifically, himself. Towards the start of the picture, he leads a crew of henchmen to an underground fortress in Antarctica, unlocks a secret chamber and comes into possession of several large, long crystal shards. But these aren’t ordinary crystals, mind you – when they are dropped in water, they grow into land-masses! Like a seed of a plant too deadly to comprehend, Luthor dangles these items over the heads of his comrades and his former enemies, vowing to create a supreme continent off the east coast of North America that will be envied and idolized by the world’s great nations. What exactly makes it unique other than its ice-like shape and structure, we do not know, but the antagonist does enough advanced planning to at least ensure that his plan can go off without a hitch: he intends on mixing the crystals with traces of Kryptonite, which is the only substance capable of weakening the Man of Steel. In a clever maneuver by the screenplay to color these absurdities, the movie supplies the Luthor character with dialogue so sharp and dexterous that you’d almost never suspect it was manipulating your disbelief into unquestioned acceptance. When he openly announces his plans to a crowd of onlookers anxious with intrigue, he is persuasive, precise and charismatic to a fault, genuinely engaged by the assumption that his scheme could be seen as legitimate or even interesting in any kind of movie. Fortunately for us, experience with comic book screen adaptations ranging from the absurd to the downright implausible have made us invulnerable to the alluring charm of his parley. Plus, Spacey is not exactly 100 percent convincing in the role of Lex Luthor, either. Whereas most actors in these kinds of roles usually create the impression that their characters understand and accept crazy ideas, Spacey seems dissonant with the entire concept. He is not playing Luthor with basic strategy; he is just going with it as if it’s just another role and another paycheck. Visually, the movie strikes all the right chords. It doesn’t rely on endless explosions or chase scenes. It depends on special effects only up to a point, spending most of the time surrounding its characters in environments that, to the general eye, are so precise and detailed that they are never thought of as being just big elaborate movie illusions set on top of green screens (Metropolis the city could be just as real as Chicago or New York for all the movie suggests). The film, furthermore, is highlighted by what is perhaps the most ambitious and tense visual effects sequence seen in some time, in which Superman is forced to save a falling passenger plane while its wings burn off and its nose hurls ever so swiftly towards Earth’s soil. Setting it softly on the pitcher’s mound of a baseball field, he tears off the door, checks to see if everyone is okay, and flies off in the distance. The world is both excited and stunned: this is the first time the hero has been seen in public in five years. Where has he been? What has he been up to? The audience asks these questions frequently, but there are no clear answers. The movie doesn’t have time for that. After all, it’s too busy spending time with a villain who intends on taking over the world by dropping crystals in the ocean.